But in climate proof cities turf can no longer ‘just be turf’. Next to being a preferred playing surface it should also be regarded as a multifunctional urban surface providing essential ecosystem services for the city such as stormwater retention, flood mitigation, urban heat island reduction and drinking water use minimisation. The key ingredient for all these valuable functions is water. With too little water the turf will not grow and will not cool the environment. But in a world where fresh water is more and more becoming a scarce resource, irrigating turf with drinking water becomes undesirable. 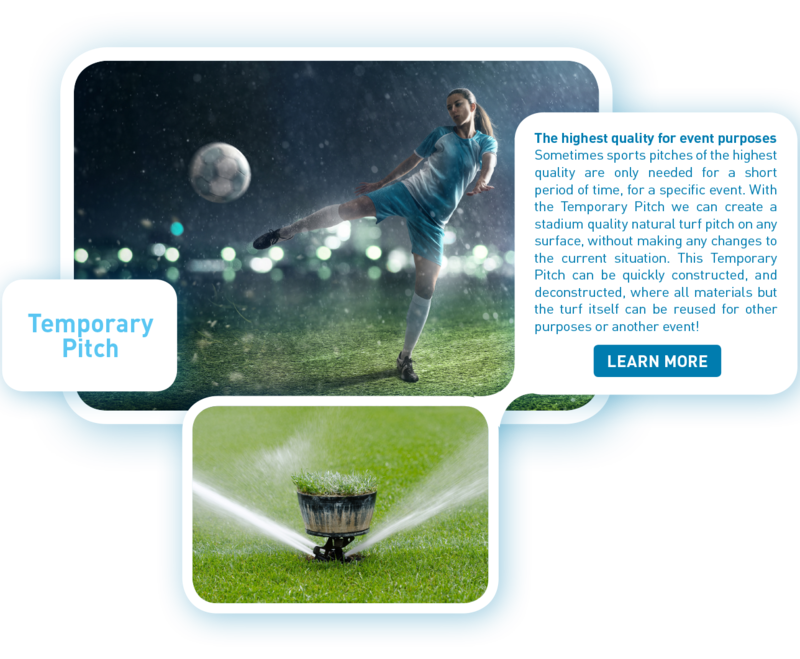 At the same time, with shorter and heavier downpours in summer months in most cities, users want to get rid of rainwater as soon as possible, to prevent mud and water pooling on the playing surface. This apparent contradiction of too little-too much water is the exact core of the BLUE2GREEN concept. Why get rid of valuable rainwater if you could use it for irrigation purposes? The BLUE2GREEN system drains rainwater quickly into the Permavoid® drainage layer underneath the soil, where it is stored and used for irrigation purposes during dry periods, minimising irrigation water needs. The Permavoid® drainage layer consists of 85 or 150 mm deep, high strength geocellular units with a 96% void ratio, and is a drainage, conveyance and storage system combined, not requiring the installation of tanks, pipes or valves. The second question that needed to be answered for the development of BLUE2GREEN is how to get water from storage underneath the turf back into the soil? 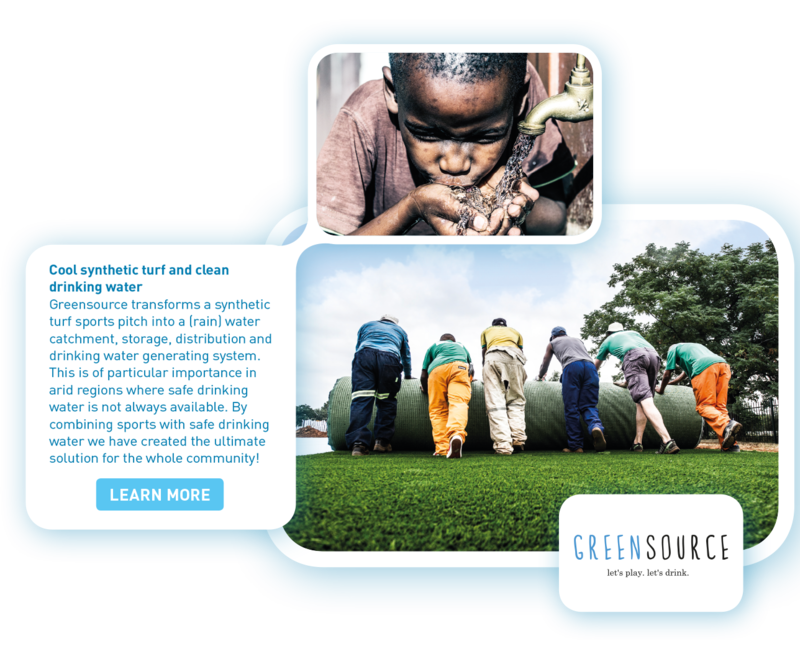 The turf is irrigated using capillary active fibres, placed in cylinders inside the system. These fibres create a very stable soil moisture content. 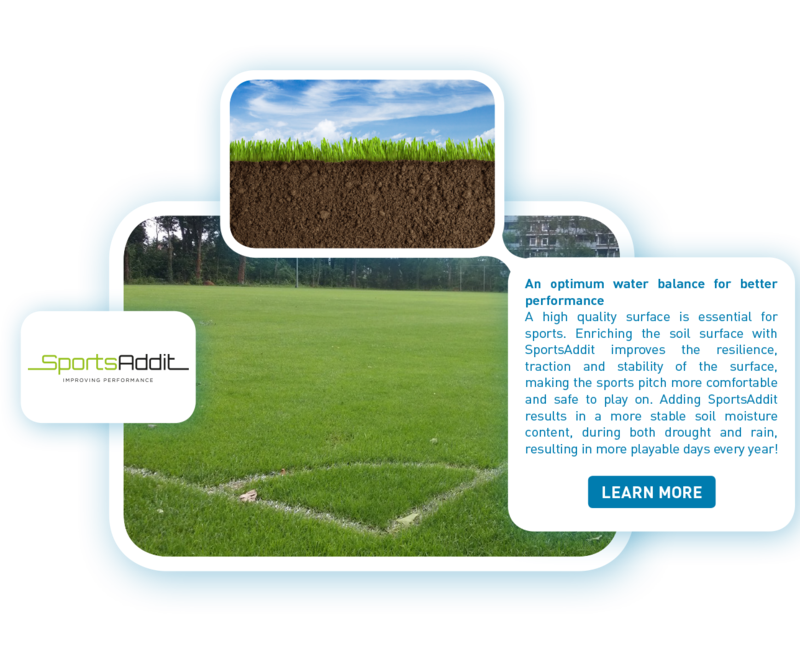 The system creates a natural capillary equilibrium that replenishes water from the system to the soil the minute the turf has evaporated it. The capillary column between storage, fibres, soil and turf is always intact eliminating the dry-wet cycle turf normally experiences, which improves turf growth. And this capillary column works both ways: because it is already established, rainwater entering the soil will be immediately directed to storage, preventing over-wetting of, and pooling of water on, the soil surface. 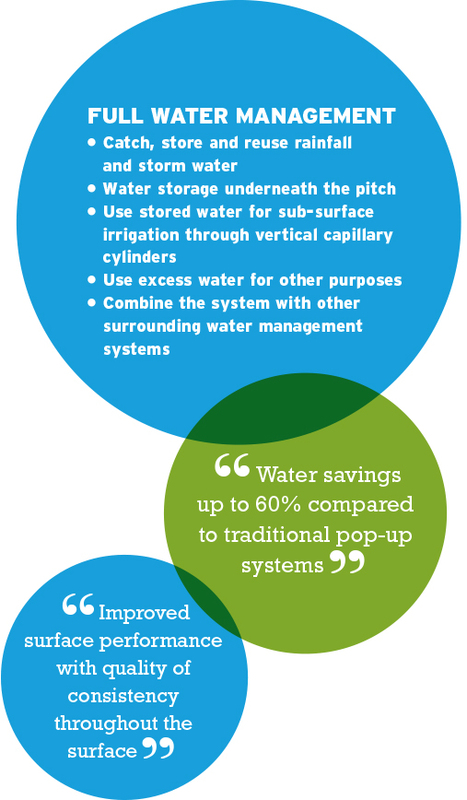 Most importantly: this natural capillary form of irrigation requires no pumps, sensors, valves or energy and negates the use of surface irrigation, saving up to 60% of irrigation water. Costly surface evaporation of irrigation water now belongs to the past. 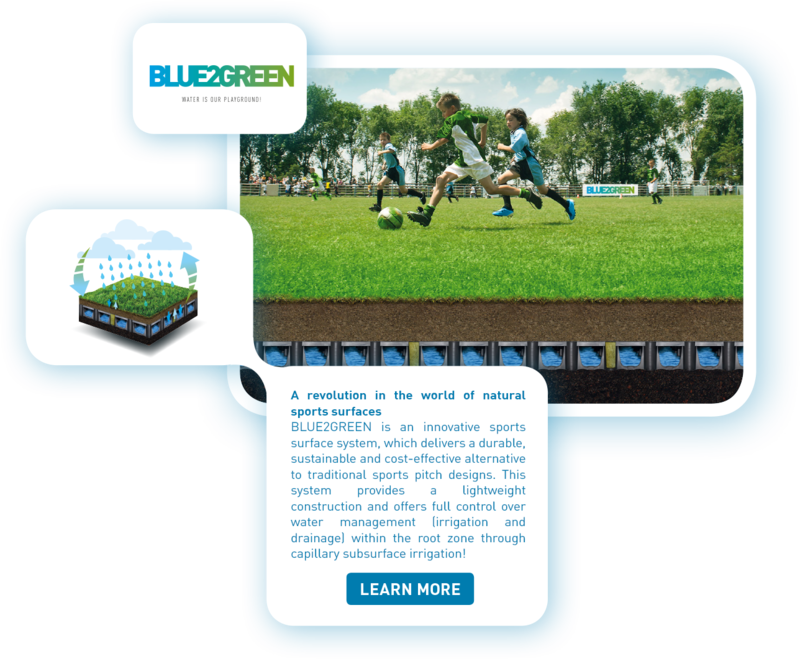 BLUE2GREEN elegantly integrates the sports surface, rainwater harvesting, water storage and natural irrigation, improving turf growth and the natural cooling capacity of the pitch.